FILE - In this Nov.
Two demonstrators have been arrested outside the Alabama attorney general's office during a protest over the 2018 shooting death of a black man at a shopping mall. Law enforcement officers on Wednesday afternoon led two women away in handcuffs after a demonstration over the state's decision to clear a police officer in the shooting death of Emantic "EJ" Bradford Jr.
Bradford was killed Thanksgiving night by a police officer responding to a shooting at a shopping mall in the Birmingham suburb of Hoover. Demonstrators on Wednesday banged on the front door at the office of Attorney General Steve Marshall in Montgomery. They shouted Bradford's name and demanded to speak with Marshall. Most of the protesters left after a state law enforcement officer read an order to disperse. The two women were arrested on disorderly conduct charges after they returned. One of the women said they returned to get signs and other property that were left behind. 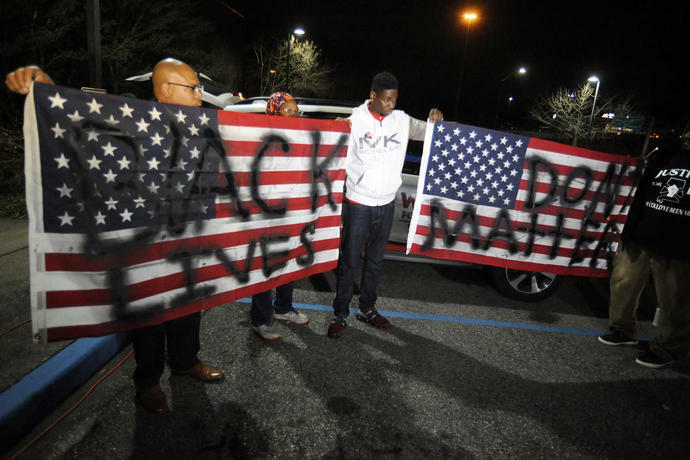 The parents of a black man killed by a police officer joined in a protest outside the Alabama attorney general's office a day after the state cleared the officer of wrongdoing. The mother, father and grandmother of Emantic "EJ" Bradford Jr. were with other demonstrators Wednesday in front of Attorney General Steve Marshall's office in Montgomery. Emantic Bradford Sr. says his son was murdered. EJ Bradford was killed by a police officer responding to a shooting at a shopping mall in the Birmingham suburb of Hoover on Thanksgiving night. Marshall's report says the officer mistook Bradford for the gunman, but was still justified in the shooting because Bradford was running with a handgun drawn. An Alabama mayor says officials are relieved over a state report that cleared a police officer of wrongdoing in the fatal shooting of a black man in a busy shopping mall. Hoover Mayor Frank Brocato discussed the state review at a news conference Wednesday. 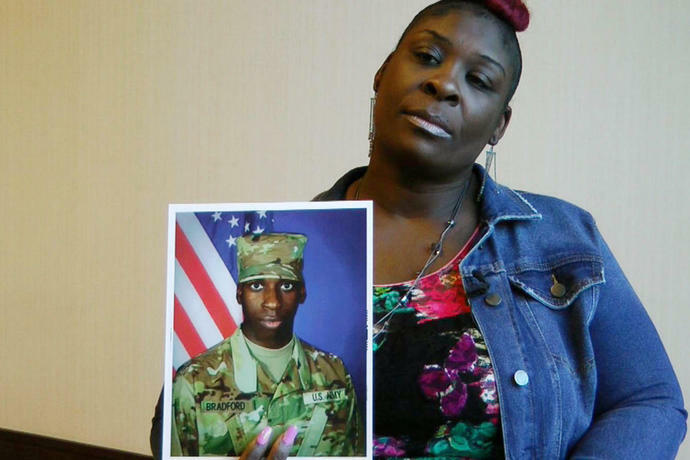 Brocato expressed sympathy for relatives of Emantic "EJ" Bradford Jr., who was armed when an officer mistook him for the gunman in a shooting in a mall on Thanksgiving. But the mayor says the shooting also caused anxiety for the whole city, and he's relieved the investigation is over. Brocato says the city will pay for the legal defense for the officer in any civil lawsuit stemming from the shooting. An Alabama city is responding to the state's decision against prosecuting a police officer who mistakenly killed a black man in a shopping mall on Thanksgiving. Hoover Mayor Frank Brocato and others have scheduled a news conference for Wednesday morning about the slaying of Emantic "EJ" Bradford Jr.
Alabama Attorney General Steve Marshall's office announced Tuesday that a police officer won't be prosecuted for fatally shooting Bradford at a mall in Hoover as Black Friday shopping began. The officer mistakenly shot Bradford after seeing him running with a gun following a shooting. The review showed that Bradford didn't shoot his gun. 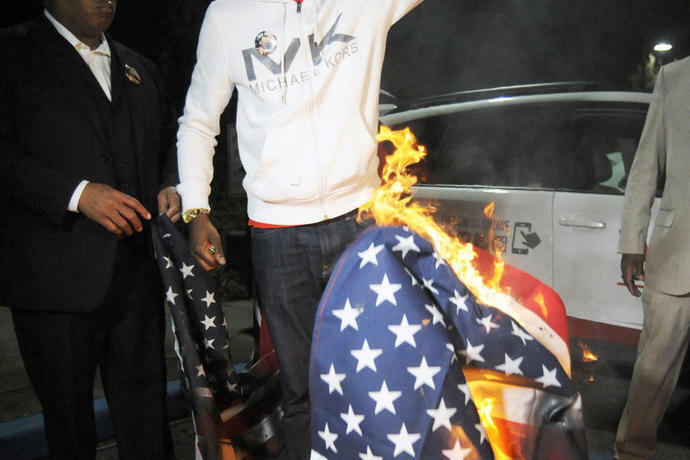 Demonstrators burned U.S. flags outside Hoover City Hall after the state's decision against charges. Activists say they'll protest at the attorney general's office in Montgomery on Wednesday.